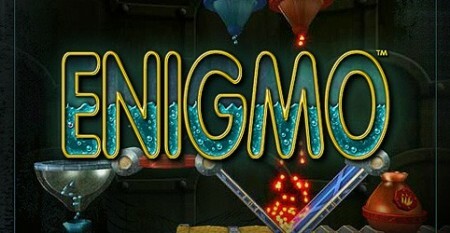 Beatshapers brings you more puzzling fun with their drippy PSMini, Enigmo. Is the water spraying action splashingly good, or does this game end up all wet? The basic idea behind Enigmo is a simple one: a colored jug drips liquid out in a steady stream. You must use basic tools to direct that liquid into the matching jug on another part of the screen. Once the jug fills up, the level is finished. 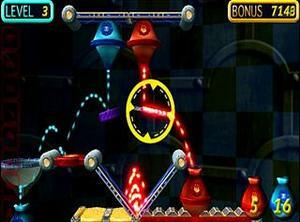 Some levels feature only one type of jug, but many have two or three. The liquids must be directed only into the jug that matches the one they came out of, and you are given a limited number of tools to direct it with. These include various type of slides, splitters, bumpers, etc. Each of the tools directs the liquid in unique ways, so you’ll have to use a lot of trial and error to get the right ones into the right position, and you’ll need to plan your attack very carefully in order to move the liquid in the correct way without running out of tools. 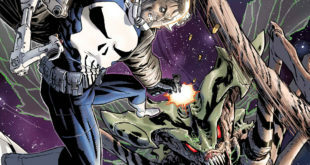 If this already sounds like a lot of action on a small screen, you’ve got the right idea. With three different types of liquids dripping and bouncing all over the screen, things get rather complicated pretty quick, but that isn’t all there is to the action. For one thing, the environments on Enigmo are generally pretty convoluted. With various walls, curves, and other obstacles, you are often required to bounce the liquids off multiple tools and walls to get it to go around corners, through small openings, and through any number of obstacles. There are also switches and keys that must be activated. 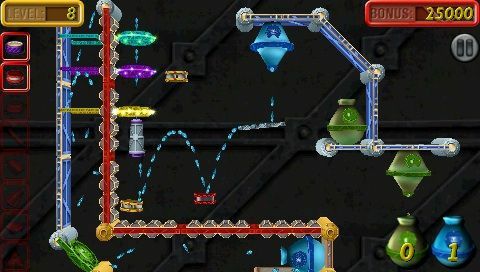 The original liquid, water, is in blue jugs, and it starts dripping right away when you bgin the levels. However, the other two liquids, lava (in red jugs) and oil (in green jugs), do not drip until their switches are activated. To do this, you must hit a color-coordinated button with a spray of water. Now, keep in mind, you still have to make the water go into the blue jug as well, which would seem to be a simple thing: just activate the button and then re-direct the spray. But that isn’t going to work, because the button must be hit with a continuous spray. What that means is you must direct the water in such a way that it both hits the button and then falls into the blue jug. Added to that, in the many levels that contain all three jugs, both the red and green buttons must be activated. Now that is some complicated puzzling. But, it gets better. There are also keys, which open “doors”. Many jugs a located behind colored panels. In order to open the panels to allow the liquid through and into the jugs, you must send a spray of liquid through a corresponding colored hoop, generally located in an entirely different section of the board. And you guessed it, the liquid must spray through the keys continuously in order to keep the doors open. I use plural here, because most of the time you will be dealing with more than one key. As I said, to finish the level you must fill the jugs up, with 40 droplets of liquid. But filling them up isn’t really the end of it, because if the flow of liquid stops at all, the jugs will empty themselves out. That means if you fill the red jug up and then redirect the spray, the red jug will be empty in mere moments. The end solution to each puzzle must have all the liquids spraying continuously into every jug, key, and button. This can be insanely difficult, and it is imperative that you have a very good grasp of what each tool does in order to succeed at the more difficult levels (the difficulty really ramps up at around level 10). And this is where Beatshapers pretty much dropped the ball. This intensely complicated game with many important factors has no real tutorial at all. On the main menu, before you enter the game, there is an option for “Help”. If you select this, you will be able to read a little manual that kind of tells you what each button and tools does. It is quite basic, it doesn’t do much besides describe pieces, and it is not accessible mid-level. That, my friends, is the extent of the tutorial. If you simply turn on the game and start playing, you will really have no idea what you are supposed to do, how you are supposed to do it, or even what each piece does. There is no hint system, either, so if you get stuck you are kind of out of luck. You also cannot save a level and come back to it; it’s sink or swim here. The look of Enigmo is pretty slick, and all the different liquids bouncing and dripping through everything imaginable is really very cool to look at. The levels get more and more complicated, and cover ever larger areas for you to master, which gives you a lot to see and play around with. What I didn’t care for is the sound. “What kind of music does it have?” you may ask, and I will tell you: It doesn’t matter. It doesn’t matter, because what you will be treated to throughout all your gameplay is the constant, brain-numbing “drip, drip, drip” of all those liquids bouncing loudly around the screen. I guarantee you will not notice any other sound than that, and I also guarantee it will start to drive you slowly into insanity after just a couple levels, at which point you will either turn off the sound, the game, or both. Enigmo is a puzzle game with lots of elements of a true keeper: challenging puzzles, a unique design, lots of twists that change your play, and 50 different levels to test your skills. Unfortunately, with no tutorial and torturous sound, it falls short of what it could be. I give Enigmo a 6.5 out of 10, and recommend it to puzzle fans looking for a real challenge. Bring your own tunes.